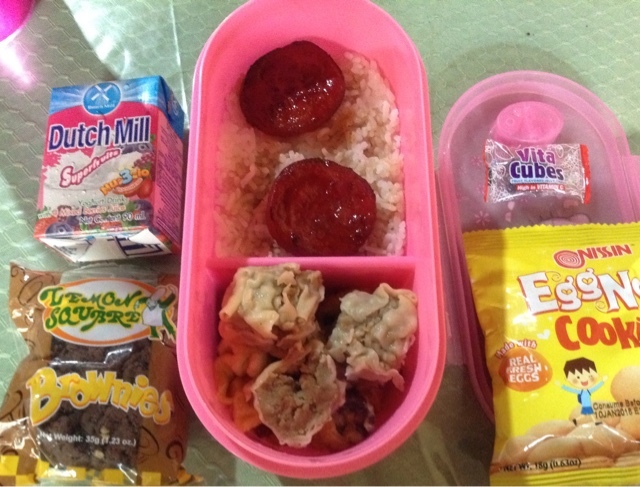 To make my kid finished her meal, I made sure to prepare them kinds of food that they like. For the past two weeks, it's hard to think of what snacks and lunch to prepare. When you're a lack of budget, the tendency is, you'll buy easy to cook and the ones I can afford budget-friendly food. I still don't have food picks but I did my best to make it look good and I want my kid to not stressed out with eating food. 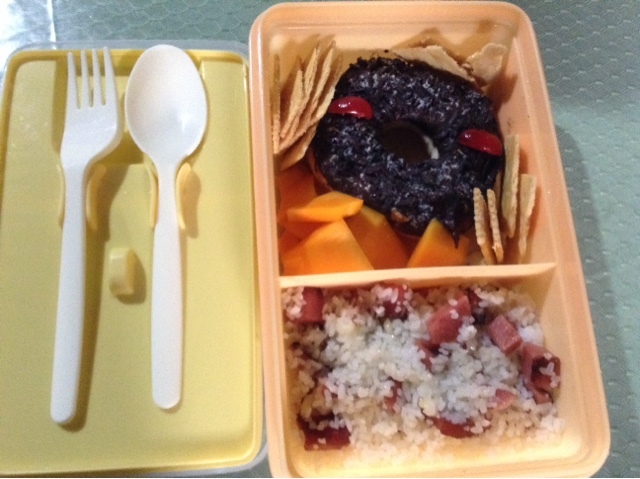 June 20, my Queen's lunch was round tocino from Mekeni, homemade shaomai, and a scrambled egg. If you think it's too much, no. My purpose was for her to eat more so that she will gain weight. Being a picky eater makes her so thin. For the snack, I bought her Dutch Mill superfruits flavor - a yogurt drink that contains the goodness of milk, yogurt, and real fruit juice. I added one Lemon Square brownies flavor cupcake, and Nissin eggnog cookies. I have a newly found jelly candy for my kids which is high in vitamin C - Vita Cubes. It is fruit flavored jelly candy that can help increase immunity. If I don't have any more foods in the refrigerator, canned good is always on the side. I opened one Purefoods Star meat loaf. I coated it with egg and Crispy Fry for another taste and to stay in shape because usually when you fry it without egg, it will be crushed. Some may or may not crushed. I also fried Star Cheese Dog. For the snack, we have brownies brought by my sister, two Vita cubes jelly candy, wafer stick and orange flavored Dutch Mill for her drink aside from water. I cooked just fried rice with sweet ham toppings good for lunch or she can have it also for a snack. Buttercream crackers on the side plus crunchy sweet sliced papaya. I told her to eat the papaya because it's sweet, not too ripe which makes it crunchy and not so soft. The most exciting one to eat was the donut. 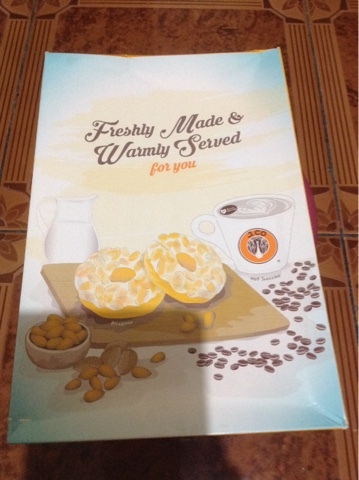 It's our first time to taste the most popular donut in town -JCO Donuts. It's Forest Glam! I don't know much about the flavors but my first try was the Al Capone. Almonds and white chocolate are the best. 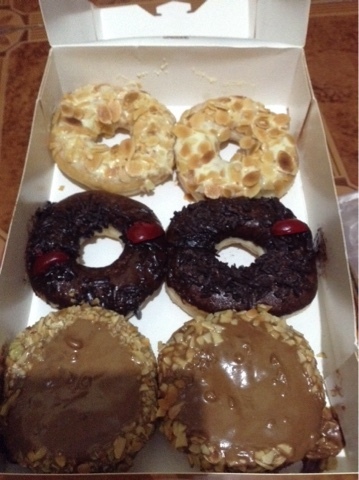 My sister Rochelle bought it again when she went on a date in Mall of Asia. Rice and chicken barbecue for lunch. Marinate the chicken with a little vinegar if there's no calamansi, soy sauce, onions, catsup, salt and pepper and some seasoning like Ginisa Mix. Mix it together. Fry the marinated chicken to a hot cooking oil in the pan. Lower the fire to prevent it from getting burnt. 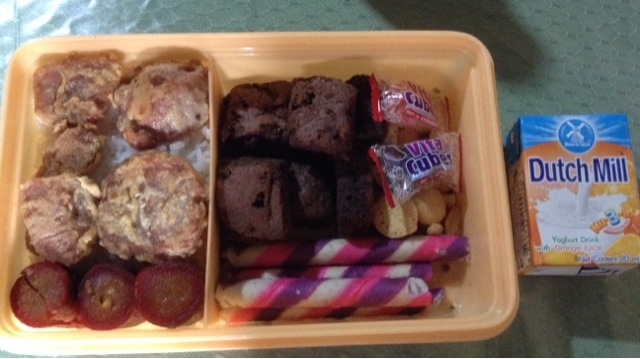 For the snack, Dewberry sandwich cookies, lemon square mocha, mini magic flakes choco flavor and Voice strawberry crakers. 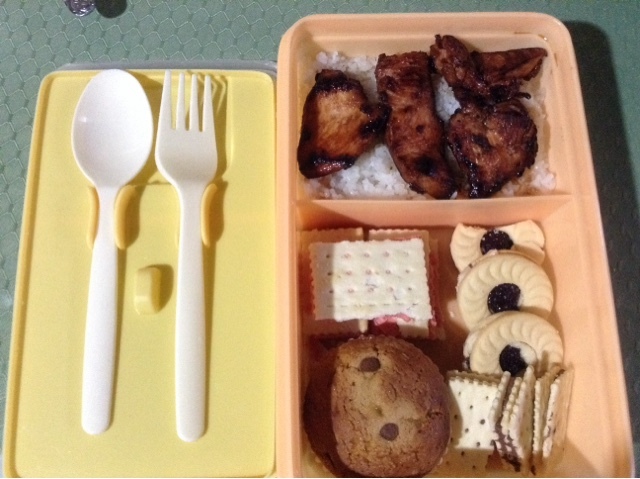 I have to add more biscuits so that she can eat some after class. Sometimes, my Queen was not in the mood to eat rice. She eats her lunch at home.She needs to be monitored or else she won't finish the food. She'll leave it covered at the dining table so I won't notice it. I am her number one enemy when it comes to eating fruits and vegetables. She doesn't like to eat healthily. Bad habits, I know. That's why I keep on telling her and show her the food that we eat when we're dining together, we always have fish, fruits, and vegetables on our plate. I got disgusted a lot when times of feeding my kids. But as every mom says, just be more patient and keep cool. Eventually, they will learn to eat by themselves without asking or requesting anything. They will eat what's on their plate, whether be fruits and vegetables.